For those of us who have skied Mt. Rose for years, we were all thrilled to hear that one of our favorite resorts in Tahoe received ‘tentative” approval to move forward with a much anticipated expansion. 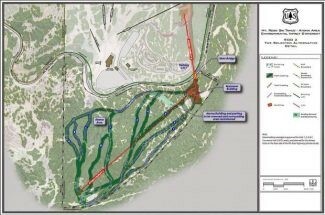 The project includes the addition of two more chairlifts, eleven new runs, and restrooms. One of the more significant features of the Atoma expansion is a proposed ‘skier bridge’ that will cross Mt Rose highway and connect the existing terrain with the new mountain features and 112 new acres of skiable terrain. In addition, and in continuation of the resorts multi-million dollar snowmaking expansion last year, the project also includes a water pipeline to provide new snowmaking coverage; and a 5-million-gallon water tank to support snowmaking (pictured in the illustration above). Included in the ‘tentative’ approval is a caveat that prohibits future development of commercial uses across all but about 180 of the 3,446 acres on bordering national forest land. The entire project is now in a public comment period. For more details, visit SkiRose.com.